The JIMP-worthy Mercedes CLS Shooting Brake concept's going into production for sale in 2012. If someone at Daimler's screwing with us, we'll have Dieter Zetsche's head on a platter. Hear that Dr. Z? Decapitation. This shouldn't be a complete surprise as we've known a CLS wagon variant was on its way and the concept looked production worthy. But we girded ourselves for the possibility of yet another crossover-type monstrosity. We're so excited that we're going to ignore that they're calling it a "brake" instead of a "break" and that it's four doors instead of two. We don't care if they can't count as long as they build it. 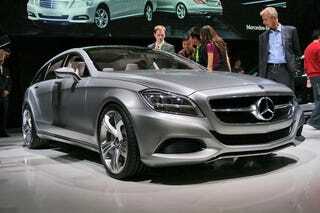 No word yet on an AMG version yet but we'll be pestering Mercedes to build one. It's all in a name: the origins of the name "Shooting Brake"
Break, or the homonym Brake, was the name once given to carriages used to "break" in wild horses and also to restrict (or "brake") their urge to move, so that they could be put to use as work horses. Since the carts could easily be broken as part of this process, people tended not to use ones which they may have urgently needed for other purposes. Where necessary, "Brakes" were often fitted out with variable bodies, which were only really used to carry along anything that may have been necessary for the hunt, for example. Any such vehicle which was used when going out shooting was called a Shooting Brake or Shooting Break. In the 1960s and 1970s motorised Shooting Breaks were popular in Great Britain – exclusive cross-over vehicles, which combined the luxuriousness of a coupé with extended space on offer and additional variability.